Today I finished decorating the last of my twelve Christmas trees. Hey now. Pick those jaws up off those keyboards. I've cut back. Honest! I used to have thirteen Christmas trees. Now all I have to do is a couple of finishing touches, a general dust and tidy, and some baking, and then I'll be ready to take photos to share with all of you. But let me tell you about something special that happened last night. The last time Casa Kittling was gussied up. If you'd like, you can click on the photo to the right to see it in a larger size. It was taken the last time the house was gussied up for Christmas. In it, you'll see two things in particular: (1) Desert folks are strange. We do put lights on our cacti. (2) There is more than one Christmas tree inside the house. That's all the sneak peek you're going to get. Anyway, back to last night. Casa Kittling is in a cul-de-sac. Our neighbors to the left are from Mexico, and I love the homemade tamales we receive just before Christmas. The neighbors to the right are from Bosnia, and the youngest boy tends to be the guardian of our outside Christmas decorations. The second he sees something a bit out of alignment, he rings the doorbell to tell us about it. Last night was the first time we turned on all the Christmas lights both inside and outside the house. 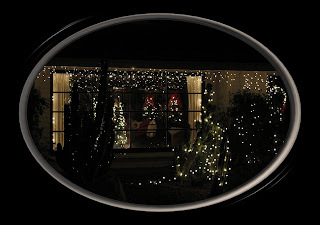 The last lights to go on were in the library, and I happened to look out the window to see that both families-- and even the family from across the street-- had come out of their houses and lined up along the fence to look at everything. The children oohed and ahhed when the lights went on in the library because I'd never decorated the room to the degree it is now. Before I knew it, there was an impromptu party going on outside, and when Denis went to work, he was congratulated by them all on the appearance of the house. Something tells me they missed not seeing our Christmas spirit last year! To be honest, I don't decorate for anyone other than myself. Seeing my home gussied up for Christmas makes me smile and puts a spring in my step. To bring enjoyment to others through something that makes me happy is just icing on the cake. Hopefully I'll bring a smile or two to your faces when I post my photos in the near future. Oh. Yeah. 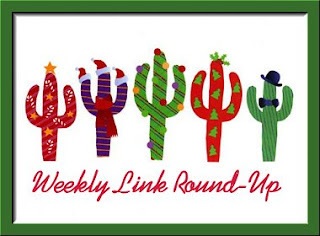 This is a link round-up, isn't it? Hang on, I've got them right... here! Want a bespoke (custom made) library? Neiman Marcus is the place to go! The influence of Twitter on a reader. Library budget cuts threaten community services across the country. How about a dollhouse-sized library vignette on a bookshelf? A website that features the bookshelves of creative people. Trust me, not everyone is a neatnik! What an imagination! Here's a full-size Tardis bookcase! Just click on the photos to see them in larger sizes. Chris Grabenstein's Tilt-a-Whirl is 99¢! Need help figuring out how to gift an eBook? Give the Gift of E.
That's it for this week. I was a bit busy ho-ho-ho-ing and didn't spend as much time looking for goodies, but don't forget to check back next weekend when I'll have a freshly selected batch of links for your surfing pleasure! The story of your neighbors has me smiling this morning. Cathy - How very cool that you created a party for your neighbours like that! And wow - what a light show! Oh, and thanks for the links as always. It's wonderful when something you do out of love draws others together. What a great story! Candace-- It certainly made me smile! Kathy-- It certainly surprised me, let me tell you! Pepper-- I'm not a Dr. Who fan, but I love that bookcase!